+ Between 2007 and 2016, median household income for the Albany metro increased a little more than 19 percent to $65,855 (+/-2,050), according to the Census Bureau. *** For the city of Albany, the increase was a little more than 13 percent, to $42,302 (+/-3,456). + The federal government tracks a measure called Regional Price Parities that's used to compare to the cost of broad categories of items between different parts of the country. For 2015, the latest year available, the RPP for the Albany metro area was 99.7. (The national average is 100.) But for rents it was 105.1, indicating rents were about 5 percent more expensive here than the national average. 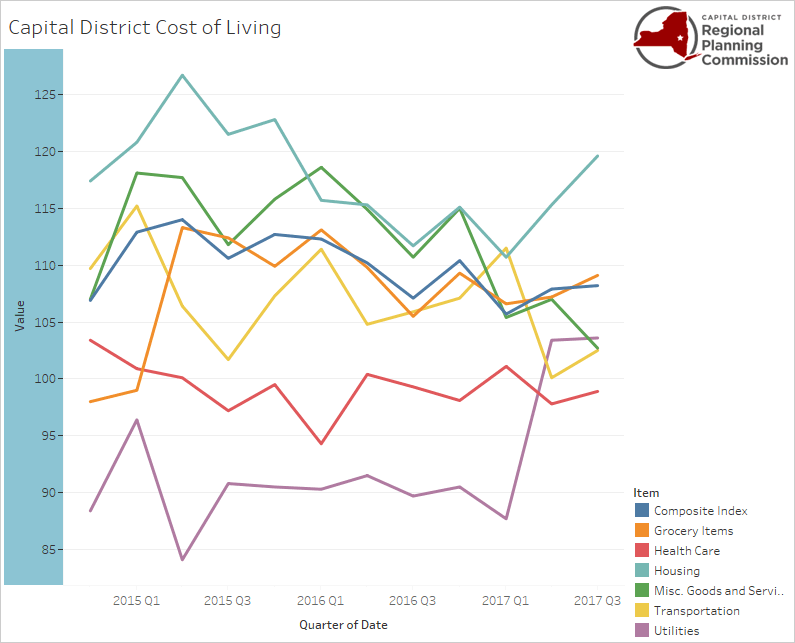 + A similar measure tracked by the Capital District Regional Planning Commission and partner orgs pegs the cost of living in the Capital Region at about 8 percent higher than the national average for the third quarter of 2017. But the cost of housing was pegged at almost 20 percent higher than the national average. * American Community Survey 1-year estimates. ** According to the federal Bureau of Labor Statistics consumer price index inflation calculator. *** American Community Survey 1-year estimates.